When the large initial capital investment is a hindrance or the local limestone availability for manufacturing of cement is an issue, Portland Cement Clinker Grinding Plants is the only answer. The Raw clinker available with ease in large quantities is grinded to produce Portland cement. 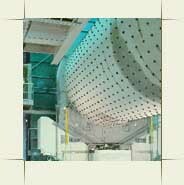 A Clinker grinding plant is a straight forward process. The clinker is transported to feed hopper, which feeds it into the Pre-crusher, Table feeders extract it out form the pre-crusher and feed it into a Ball mill, Blending of this fine powder with gypsum and other additives makes it the portland cement, Packing Plant and Material Handling equipment completes the offers. SABKO INDUSTRIES GROUP offers clinker grinding plants from 50 TPD to 3000 TPD on turn key basis. Heavy duty steel plates are rolled to form the Mill Shells; the rollers and pressing machines are used to maintain the shape of the shell perfectly during the manufacturing. 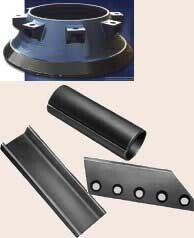 Precise templates ensure the holes for liners are drilled in perfect distribution. X-ray quality welding eliminates any chances of cracks or creceps. The High Carbon Steel, Cast Manganese Steel and Ni-hard liners are essential part of the mills and are designed to give optimum production. Ensuring the optimum level of material filling ratio in each chamber of Ball Mills is the key to high performance and maximum use of grinding energy of the Mill. EN Grade trusted steel shaft housed in spherical roller bearings is coupled with Hob-cut girth gear and EN-19 pinion. Larger mills of 125 HP and up require to be driven with helical or worm reduction gearboxes coupled with motor as shown in the figure. The pay loader carried raw materials, Clinker and Gypsum are carried from stock yards and dumps into a dump hopper. A Vibro-feeder controls feed rate. The Granulator which is feed by means of a belt conveyor Crushes, and then stores into the respective Silos/Hoppers by means of a Bucket elevator. 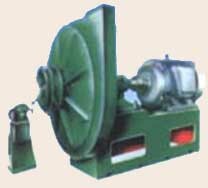 The table feeder than feeds the crushed material in the desired proportion to the Ball Mill hopper. The mix is intermediately stored to the Ball mill hopper by a Bucket Elevator. A mill feeder is installed to control the feed rate to mill, and adjust the desired fineness. The ball mill grinds the mixture which can now be called Portland cement. The Cement thus produced is stored into the Cement Silos. To ensure homogenized and consistent quality of cement, the same is blended through the aeration assemblies. The Screw Feeders extract and transport the Cement to the Packing Plant where a preliminary screening removes any foreign/unwanted particle and than stores it into a hopper where it is packed with the help of Auto Packaging plants. The Spillage that may occur during the packing is collected into a spillage hopper installed vertically below, is than recycled to the system. The packed bags are loaded into the trucks and or transportation means ultimately bound to the markets for sale. most popular online casino and online gambling reviews.